Next to slow turnaround, unclear mortgage penalties are one of the biggest concerns for many brokers – especially given how many different ways they are calculated. According to Mararaj, not only are certain lenders doing whatever they can to saddle clients with the largest possible penalty, it can become confusing when dealing with all the various rules. “Trying to figure out the penalty is frustrating [from lender to lender] and many of them are creating much bigger spreads," he said. It’s a source of growing frustration for brokers, especially given the fact that so few Canadians read their mortgage documents and fully understand them. According to a recently released study by Scotiabank, only 33 per cent Canadian homeowners admit that they have read their entire mortgage agreement. And only 27 per cent fully understood the details of their home loans. And with 60 per cent of people who took part in the study believe prepayment privileges as the second most important factor in choosing a mortgage, just below rate. "Buying a home is both exhilarating and stressful, which is why a meeting with a financial advisor to understand all of the terms and conditions of a mortgage agreement will ensure customers get the mortgage that is right for them," said Scotiabank's David Stafford, managing director of Real Estate Secured Lending of the report’s findings. "Flexible features like prepayment privileges, bi-weekly payments and the ability to port your mortgage can save customers thousands in interest and fees over the long term." The federal government needs to step in and set a single formula that all lenders are mandated to follow, thus protecting all consumers. @Blair...perfectly stated. Its that simple. I'm typically NOT in favour of any government intervention but here's a case where it makes sense. A better informed consuming public allows/forces all of us to be better operators, thereby improving the overall experience for everyone, not to mention how it would further level the playing field for the brokerage community. Having said that I completely understand that as good people we should live up to the commitments we make, especially legally binding agreements. However I recently had a customer quoted by his current bank approx $8300 in penalty on a mortgage balance of about $160000. As a result this guy is not going to be able resolve some recent financial troubles and will likely have to resort to even more drastic measures. The really atrocious part is the penalty charges that are calculated using theoretical/posted rates that are far in excess of what the lender would have actually realized had the mortgage not been broken. So you end up compensating them for money they actually weren't ever going to make. While I admit its within the letter of the law, it simply doesn't seem right some how. It's like "Goliath" gouging "David" simply because they can. Now wonder all of the big shiney towers downtown have their names on them. The big banks have all reduced their posted rates below 5 yrs terms, thus creating a massive IRD day one after signing a 5 year fixed mortgage. 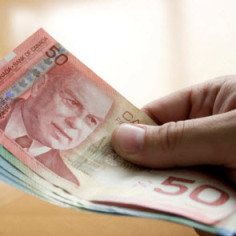 A recent TD client with 2.79 fixed rate and 3.5 yrs remaining on the term was quoted +$50k for a penalty. Low rates like this should not have any IRD penalty. All the big banks are the same and yes Blair the gov't needs to step in and fix this issue. You cannot allow banks to arbitrarily set posted rates only to beef up pre-payment IRD penalties.